Hot Rods & High Heels lets Branson celebrate the 50’s once again in one of the most popular Branson shows! No matter how many decades pass us by, our hearts long for the 50’s; whether you’re a baby boomer who experienced the era, or a teenager just discovering its appeal, there’s something about that decade that will never fade away. And there’s so much to love…the clothes, the cars, the songs, the atmosphere of soda shops, record stores, drive-in diners, and sock hops; it speaks at once of innocence and of romance. Hot Rods & High Heels vaults us back to the best of those good ol’ days with singing and dancing from an incredible cast; an ensemble of some of Branson’s best performers. If you’ve been there, relive it…if you long for what’s before your time, discover it…the fashion, the fun, and the frivolity of the fabulous 50’s, only at Hot Rods & High Heels, in a place that keeps all the musical decades and genres alive and kickin’…Branson! 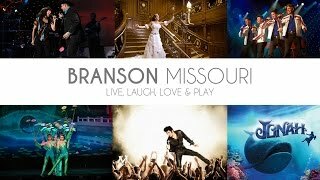 Book your tickets for one of the best Branson shows now.